Just because the top five web sites on the sector only represent 46.5% of the traffic in October 2001 does not mean that their influence is negligible. Indeed, we can see that the next five web sites only represent 17% of the traffic, when the rest of the sector represents as much as 36%. Indeed, this Internet category is made up of many web sites, which explains this rather large distribution. This is how we count as many as 40 TO and online agency web sites in October 2001 with an Internet coverage rate higher than 0.20%. 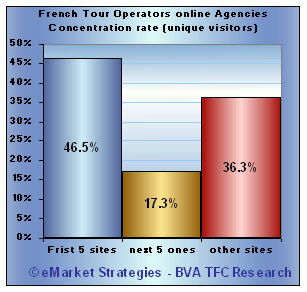 The leadership held by these top five web sites is genuine if we consider the high number of their online competitors. Please also note that apart from the arrival of karavel.com web site, very few changes have been taking place in the online distribution of the top ten web sites for several months. Only a few communication campaigns managed to modify the order of the competitors but each of them got back to where it stood as soon as its promotional operations ended. It looks as if these sites fail to attract in a lasting way the users already customised by their competitors. The issue of a really qualified traffic proves even more critical here than it is in some other Internet sectors. If the impact held by events of September 11 can clearly be seen, we can also notice that the sector is now starting to recover with an Internet coverage rate that was 19.8% in October 2001, compared to the 20.5% achieved last June. 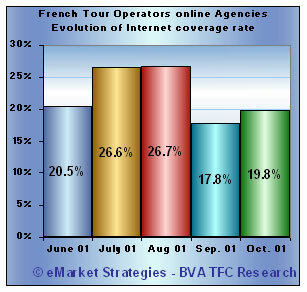 And finally, please note that in this period that proves rather difficult in the eTourism sector, Internet users on the sector still paid an average of 7 visits in October 2001, which remains rather encouraging.